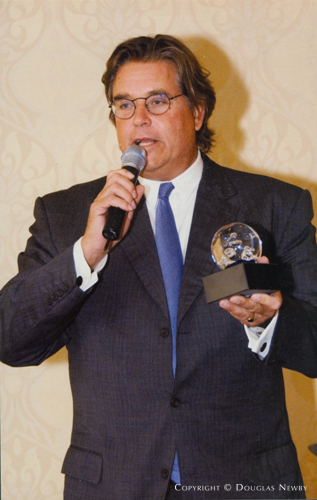 After wining The Wall Street Journal’s and Luxury Conclave’s Best Property Marketing Campaign for two consecutive years, the Leaders in Luxury presented Douglas Newby the first Hall of Fame Award ever presented for Best Property Marketing Campaign, acknowledging his extraordinary work with architecturally significant homes. Dallas and its architecturally significant homes took center stage when Douglas Newby was recently presented the Hall of Fame Award for the Best Property Marketing Campaign by the Leaders in Luxury. The top real estate brokers in the country specializing in estate properties and luxury residences met at the annual conclave to share ideas and to hear from distinguished experts on economics, design, real estate, marketing, and the direction of luxury. This year’s speakers included Greg Furman, founder of New York’s Luxury Marketing Council, and Richard Baker of Premium Knowledge Group Interactive. Earlier, Vivian Bridaham, Patricia Choi of Hawaii, Paula Berthelot of Santa Fe, Betty Brachman of San Francisco, all offering the most expensive properties in their region, made up a panel moderated by Douglas Newby that discussed their approach to consistently selling the most important homes in their market. The consensus of these remarkable agents selling homes up to $50,000,000 was their emphasis on the quality of the homes they represent versus the quantity of sales they produce. Douglas Newby and every agent on the panel said they deliberately limited the number of homes they offered for sale and the buyers they represented, as they were committed to their clients, not volume. Click here for more information on the Luxury Conclave Best Luxury Property Marketing Award presented to Douglas Newby in 2005. Click here for more information on the Luxury Conclave Best Luxury Property Marketing Award presented to Douglas Newby in 2004.